This video illustrates how it has changed pretty well. The technology behind everything is actually pretty simple. 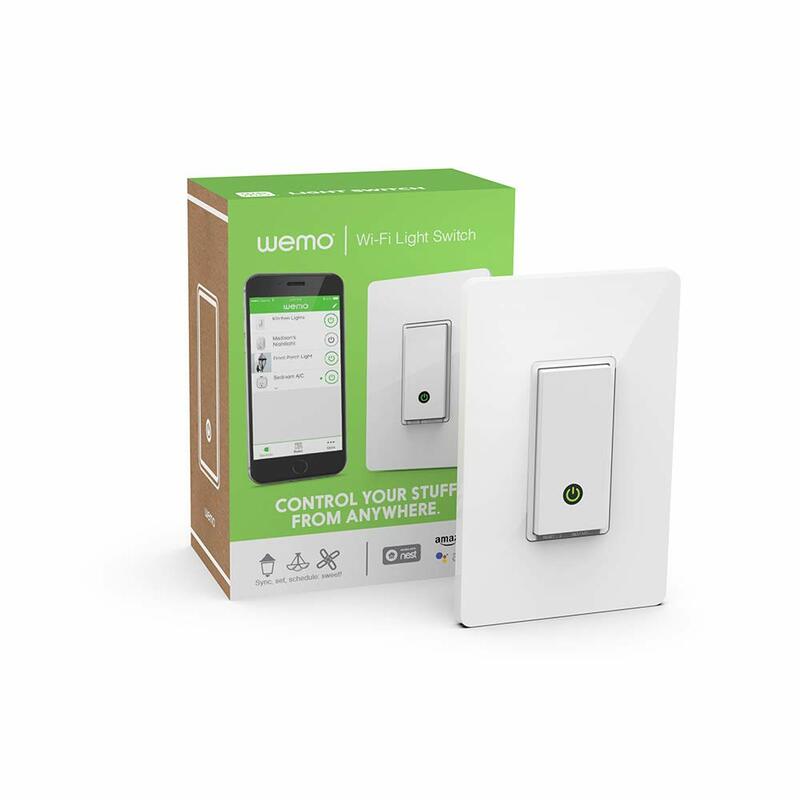 For the floodlight, it’s a standard floodlight hooked up to a WeMo Light Switch. I’ve had this switch installed for about three years now, and it’s still the perfect solution. We have 6 more of these throughout our house. 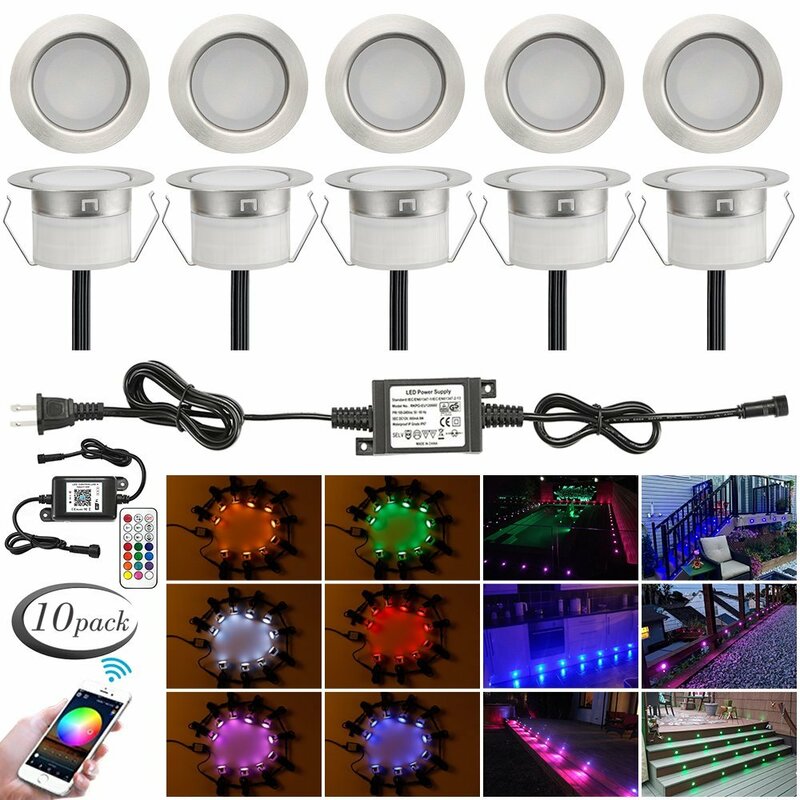 For the colored lights in the deck itself, I took a chance on a set of LED lights that I found on Amazon.com that were listed in the “Works with Alexa” category. They’re made by a company called FVTLED. Could not be happier with how they turned out. Each 10-light kit costs about $100, but has a wi-fi module, a remote control, and an outdoor power supply as part of the kit. You couldn’t see them in the dark (and I didn’t want to turn them on and wake the neighbors), but there are two speakers connected to a Bluetooth receiver mounted above the deck as well. This allows me to pair an Alexa device, or my phone, to the receiver, and play music through the speakers. 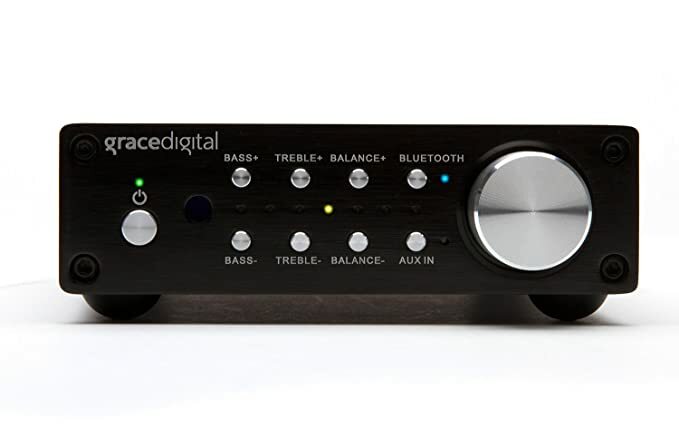 The Grace Digital receiver is small. Maybe 6 inches wide, and 10 inches deep. 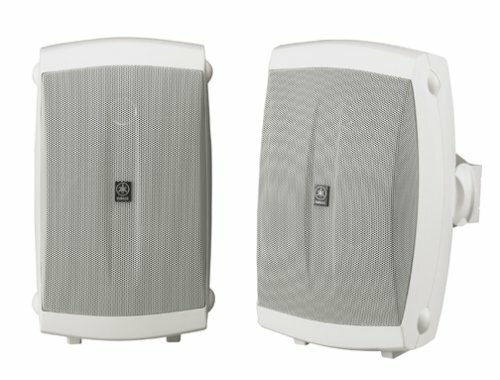 The Yamaha speakers are pretty standard outdoor speakers. I had to run speaker wire to them, and they don’t require any additional power to run them. Overall, I’m pretty happy with how this turned out. I don’t actually expect that I’ll be running techno dance parties with flashing colored lights, but I love that I have the option. Most of the time, I expect to be running standard white (or off white) colors. Have you done anything cool to improve your outdoor living space? I’d love to see it! Last week, I had several conversations with other parents at my son’s school about technology, smart home stuff, and our kids. They were telling me about how they had a “Circle with Disney“, and how that made it so much easier to manage their kids’ time online. Normally, in a conversation like this, I tend to be the one sharing the merits of some technology (software or hardware) that is somehow simplifying my life. This time, however, I was on the other side of the conversation, and it was weird. I’d never even heard of this device. (What is a Circle with Disney? I imagined it was a wi-fi router with Mickey’s ears that had simplified software for non-technical folks to understand.) Even if I haven’t tried something, I’ve usually heard of it, or at least the category. This one completely caught me off guard. So I checked it out. It’s about the size of a can of soda, and it manages and reports all of the activity and devices that are on your wi-fi network. In practical use, however, your kids aren’t the only ones using the wifi in your home. Your phone, your laptop, your television, your Xbox, your light switches, your lightbulbs, your thermostat, your garage door, maybe even your refrigerator are using it too! Nobody is going to change the wifi password on all of those devices every day, just to get their kids to do a few chores. Circle solves that problem by giving you the ability to turn access to the Internet on and off for every single device (or person) on your network without any effort. This means you can set specific limits for each person or device in your home. When you first set up your Circle, you go through a quick five minute setup, and then the work really begins. You are presented with a list of every single device that is currently connected to your network. To start, you set up all of the people that live in your home. For me, that’s my wife and my two children. You can also manage access on an individual level. You can see above that I currently have five devices, and I don’t have many restrictions. I’ll take you briefly through each of the sections. I can open each of those sections and dive into websites visited, time spent at each, etc. The downside to this, at least in my situation, is that if you have a browser tab open, it seems to count that as “activity.” It’s especially prevalent when that tab auto-refreshes, because even background activity will be considered activity. It is only monitoring the traffic from these devices, it isn’t checking to see what the traffic actually is. The devices section just shows you all of the devices you’ve assigned to a specific person. It’s entirely up to you how you assign devices, but my personal rule was to classify anything that has one unique user to a person, and things like the Xbox One, which many people use, to my Home group instead. Filter level is simply some default settings for people of different ages. When the Circle detects a user trying to access content that isn’t appropriate for their filter level, it will present them with a webpage that lets them know the content has been filtered. It also restricts the apps/websites they can use, but you can customize all of it to fit your family’s needs. As you’d imagine, Circle lets you set time limits for your users, and also by specific apps. Many children need access to the Internet to do their homework, but they don’t need to be on YouTube while that’s happening. This would allow you to limit their access to YouTube to 30 minutes a day, but their total time available could be more like three hours. Bedtime is just another way to manage access times. You can set a time that everything shuts off for a specific person, so then when they’re supposed to be in their room sleeping, they’re not sneaking in another four hours of Netflix. Obviously, you can take the devices out of their rooms (as we do), but on the weekends, we tend to be a bit more lax. This lets you be as lax as you want. Overall, the Circle is an amazing device for my home. Not only can I manage, view, and control what my children are accessing, but I also get this control for any additional devices that wander into my house, like the tablets and phones of their friends. It gives me the peace of mind that they’re not going to venture to places I don’t want them going. I don’t need angry neighbors asking why their child was watching something inappropriate at my house. I get notifications every time a new device appears on my network, so there’s no way to sneak your way past the Circle, either. Finally, I have to mention the Disney angle. I mentioned that this device is called Circle with Disney. It wasn’t obvious to me how Disney was even involved, other than the name. They basically provide a portal on your network at http://mycircle.meetcircle.com. If you go to that page from any of your devices, it will tell you the specifics about the controls on that device (bedtimes, time limits), as well as a bunch of Pinterest-style photos and links to Disney content. This seems to be the only real involvement by Disney, which is fine. Yesterday ended my first month of being an active Windows 8 app publisher. The way I define “active” is that I have been consistently working to improve it since its launch. There are many apps that are thrown into any marketplace, never to see an update of any kind. In the first month, I shipped EIGHT updates. 1) Address a couple of small bugs I had identified. 2) Get the Microsoft Advertising Control to actually work in my app. Every app is going to have a bug or two, and there’s nothing terribly interesting about those, but the ads WERE tricky. I created my ad units at PubCenter (which as it turns out, is not a place to find a frosty pint.) I added an AdControl to the pages of my app using the identifiers from my ad units. But they didn’t show up in my app when I published it. In fact, after I published the first time, they didn’t show up in my development environment anymore either. I opened a support ticket with PubCenter, and after a couple of days of trading emails and eliminating the obvious problems, they simply asked to see my code, if possible. I pointed them to my github repository, where they identified that I had turned off “Internet” capabilities, and the AdControl needs this to serve ads. Looking back, this is one of the most obvious statements I have ever written. At the time, however, I seemed to me that the AdControl would probably have its own mechanisms for serving ads, and that they weren’t dependent on my app’s settings. WRONG. Anyways, once I flipped that switch on March 8th, the ads started showing up, and much to my surprise, I started making a little money. As you can see, March 18th was a huge day, grabbing me $4.55 that day. I thought this thing was just going to take off. As it turns out, that was my first day in the “New & Rising” category, and the shine slowly faded on that $4+ day. Regardless, I’ve been consistently averaging more than $2 a day, which would be over $700 annually. Not a fortune, but now I’ve got a baseline to start from, and I’ve got big plans to elevate that number over time. Day to day, I’m averaging about $2.30 for my eCPM. Since I’m averaging around 1,000 impressions per day, it makes sense that I’d be making about $2.00 a day. (I’ve had peaks of 5,000+ impressions in a day, but lately it’s been more in-line with 1,000 per day. My plans for the future are pretty simple: drive more impressions per day. One idea I have for this is to offer a prize to users who hit a royal flush in the game. This should incentivize people to play more, in the hopes they’ll win the prize. I need to determine whether or not this is really legal, as well as whether or not it’s permitted in the Windows Store. Another one is to make it more simple, and just reward those players that play more than a specific number of video poker hands each month. Something like 10,000 hands. In either case, I’m looking for ways to get more players to play more often, to drive up the number of impressions I’m getting each day, which should also drive up the amount of money I’m making each day. I’ll keep you posted on how this all works out. In general, my app is pretty straightforward. 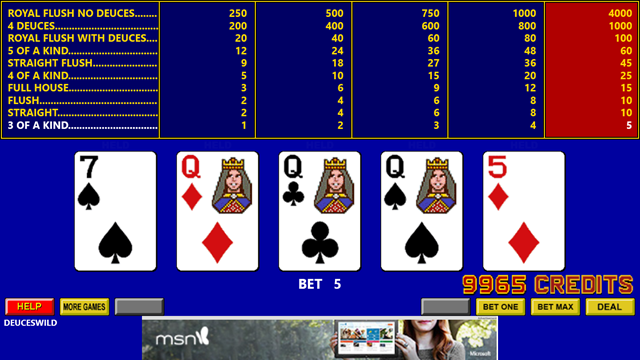 It’s a video poker application designed to look as similar to the real video poker machines in casinos as it can. Last week, I got ambitious, and decided to add some functionality that goes above and beyond the core functionality you’d expect. I added Azure Mobile Services, and if the user was online, every single hand was recorded to my cloud storage database. In the 10 days it’s been live, I’ve recorded over 45,000 random hands of video poker to my database. In addition, I added Microsoft Account authentication, which means that if you log in with your Microsoft credentials, I could persist your credit count and hand history across all of your devices. This is where the story gets ugly. I spent HOURS writing and testing this functionality. Log in on my Surface RT. Play some hands of Deuces Wild. Log out. Keep playing. Log in. Play some more. Cut the wi-fi connection. Play some more. Reconnect. Sync the hands that were played when disconnected. Log in to the Windows Phone 8 version. See the identical credit count. If you were logged in to these apps, everything worked marvelously. When you weren’t logged in, it still worked marvelously. It still logged your hands in my cloud database. My mistake was that I didn’t notice that even when you were logged out, it was trying to sync your credits. Anonymously. So I pushed this new update chock full of new features to the store. And it passed. I was so excited! And then the negative reviews started flowing in. As it turns out, everyone that wasn’t logged in was synching their credits with everyone else that wasn’t logged in. Ouch. I’ve been really careful about thorough manual testing, as well as running a full suite of unit tests, but this one got by me. I was so focused on what the experience was like for authenticated users, I didn’t give enough to time to think through all of the scenarios for those people that chose not to authenticate. I fixed it immediately, but it was Friday night, and the Windows Store team doesn’t approve apps on the weekends. It wasn’t until Monday afternoon that my new patch was finally released, and almost immediately, I found yet another issue. (It’s funny how much more obvious bugs are when they’re in production vs. development.) I now have to wait at least another day before this issue will finally be solved. My point in all of this is to take your time. I was so anxious to get my new set of features into the hands of my users, I completely neglected to remember that apps that have to go through stores are SIGNIFICANTLY harder to fix than a simple website. If I find an issue on my website, I can fix it instantly. In your app, your users may have to suffer through days or bugs before you’re able to fix an issue. Take your time, get it right, and give your users the experience they deserve. It’s the only way you’re going to get MORE users. In short, no matter how great your set of features is, a little extra diligence to think through ALL of the user scenarios will benefit everyone in the long run. That’s how you build a great app. Keep your users’ confidence high, and give them a reason to tell their friends about it. It would appear I’m going to start pumping out little “lessons learned” articles over the next few weeks, as I’ve learned an absolute TON from building my King Poker app. Today’s lesson is about capturing keystrokes. Many of you have probably done this before: you want to recognize a specific key that has been pressed when a user is entering something into a TextBox. Maybe you want to take action when they press the Enter key, for example. This is generally simple enough, you just set up a KeyDown (or KeyUp, depending on your needs) event on the TextBox in question, and then just check every time the event fires until you find the key you’re looking for. That’s not what I wanted to do. As the game currently stands, it is designed for use on a touch screen or with a mouse. Clicking/tapping on a card will mark it as “HELD,” and won’t replace it when you click the “DEAL” button. But you have to actually move your fingers or mouse to each card to mark them. For speed players, they’d prefer physical buttons that can be pressed over having to touch a screen. This is where my key capture needs come in. As you can see above, I subscribe to the Window.Current.CoreWindow.KeyDown event, which fires before anything else gets access to the key event. This is also a great way to capture keystrokes before they get to your TextBox controls, etc. And finally, in case you were wondering, here’s what I drew (I got that wild 2) to get my four of a kind! So there you have it. A simple way to capture keystrokes in C# and XAML applications for Windows 8/Windows RT applications. Many apps have a need for this in some way (even if it’s to provide a shortcut or even an Easter Egg), so consider this in your applications as well. Man, things have been crazy. I’ve got six apps in the marketplace right now, and going strong on about 7 more ideas. I was asked today if there is an official “Download My App From the Marketplace” icon that we should use when linking to our applications from the web. Turns out, there IS! You can download the whole series here, but I’ve included a few examples below for you to check out. Yesterday, I had a developer reach out to me about a seemingly simple problem, but it wasn’t until I looked at it in a greenfield project that I could solve it quickly. In the XAML below, I have a ListBox that I bind a List of objects to. What the developer was trying to do was get the text in the “AlternateText” TextBox for the item clicked. The important thing to remember here is that when you call the SelectionChanged event on a ListBox, the ListBox still recognizes each item as its original object. Therefore, you should actually be trying to access the specific object that was selected, and then access the properties of that object, instead of the XAML elements that make up the ListBox’s layout.